January 9, 2019 – Baton Rouge, LA – Lamar Advertising Company (Nasdaq: LAMR), a leading owner of outdoor advertising and logo sign displays, today announced that Keith A. Istre, Chief Financial Officer and Treasurer, has informed Lamar of his intent to retire from the company effective December 31, 2019, after more than 40 years of service. “Keith’s shrewd management of our finances has been invaluable to Lamar’s growth over the past four decades,” said Lamar board chairman Kevin Reilly Jr., noting that Mr. Istre joined Lamar as Controller in 1978 when the company’s revenue was approximately $14 million. Lamar’s 2017 revenue exceeded $1.5 billion. Mr. Istre, who became Chief Financial Officer in 1989, made his intention known to the Company now so that appropriate succession and transition planning can occur. Lamar is conducting a comprehensive search for Mr. Istre’s successor and has retained an executive search firm to assist in the process. Founded in 1902, Lamar Advertising Company (Nasdaq: LAMR) is one of the largest outdoor advertising companies in the world, with more than 348,000 displays across the United States and Canada. Lamar offers advertisers a variety of billboard, interstate logo, transit and airport advertising formats, helping both local businesses and national brands reach broad audiences every day. In addition to its more traditional out of home inventory, Lamar is proud to offer its customers the largest network of digital billboards in the United States with over 3,000 displays. Please feel free to explore our website www.lamar.com or contact us at hello@lamar.com for additional information. Lamar Advertising Company (Nasdaq: “LAMR”) will release its fourth quarter ended December 31, 2018 earnings report before the market opens Wednesday, February 20, 2019. 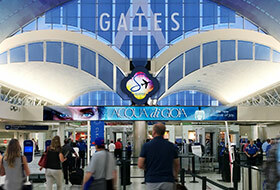 Lamar Advertising Company (Nasdaq: LAMR), one of the largest out of home media companies in the world, today announced that Lamar Airport Advertising has been awarded a 10-year contract to upgrade and manage all advertising signage at the San Antonio International Airport (SAT).